LEWISBURG, Pa. — Donald Trump has used Twitter like no other U.S. President to let the world know what he’s thinking. But based on recent Bucknell Institute for Public Policy (BIPP) polling, Democrats, Independents and some Republicans think his use of Twitter isn’t helping his image. The nationally representative survey, conducted by YouGov for BIPP from Nov. 10-14 found that around a quarter of Republicans (24 percent) say that Trump’s use of Twitter makes them think more negatively about him, compared with 84 percent of Democrats and 55 percent of Independents. About the same number of Republicans (26 percent) say Trump’s use of Twitter makes them think more positively of the job he is doing as President, while the remaining 50 percent say his use of Twitter has no impact on their views. Only 3 percent of Democrats and 14 percent of Independents say that Trump’s Twitter makes them think more positively about him. The most social media-savvy generation is the most sour on Trump’s Twitter usage. 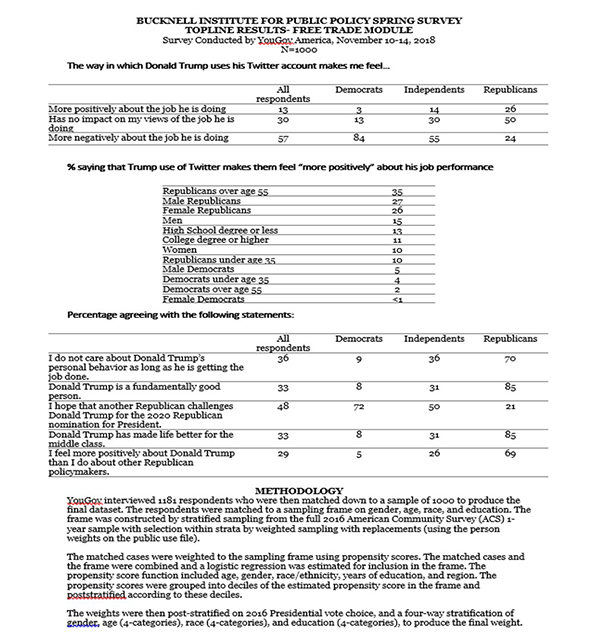 Just 5 percent of respondents under 35, including 10 percent of Republicans, say that Trump’s Twitter use makes them think more positively of his job performance, compared to 20 percent of respondents over 55, including 35 percent of Republicans. Other aspects of Donald Trump’s character and job performance produce more expected polarized responses along party lines. For example, 85 percent of Republicans say Trump is a “fundamentally good person,” while only 8 percent of Democrats and 31 percent of Independents agree with that statement. Republicans are also more likely to overlook Trump’s personal missteps if he produces results, with 70 percent responding that they don’t care about his personal behavior if he gets the job done. By comparison, only 9 percent of Democrats and 36 percent of Independents say the same. Predictably, Republicans are also more likely to say that he is delivering results, with 85 percent responding that Trump has made life better for the American middle class, compared with just 9 percent of Democrats and 36 percent of Independents. Despite declining job performance numbers for Trump overall, there remains limited enthusiasm on the GOP side for a challenger to Trump’s re-nomination in 2020, with 21 percent of Republicans responding that they wish a challenger for the nomination to emerge. Younger Republicans are more open to the idea of a primary challenge at 37 percent, compared to 21 percent of those between 35 and 54 and 14 percent of those over age 55.